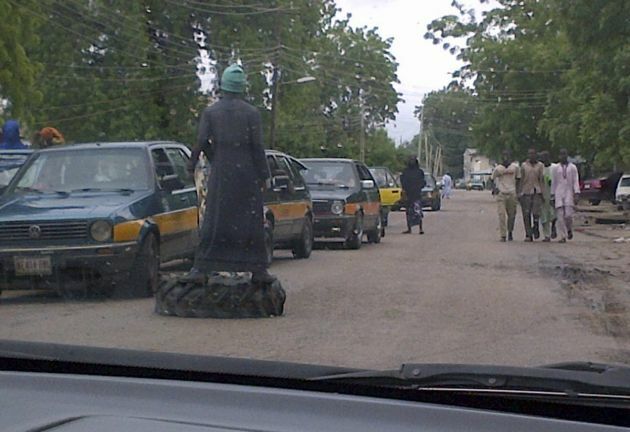 (Photo: REUTERS / Stringer)A member of vigilante groups popularly called the "civilian JTF" is seen through a car windshield as he stands on a used tyre checking traffic in Mafoni village, Borno state August 6, 2013. As northeast Nigeria's civilian population increasingly turns on Boko Haram in the form of vigilante groups, the Islamists are retaliating on civilians. Villages are being attacked, suspected vigilantes killed. Picture taken August 6, 2013. ABUJA/MAIDUGURI (Reuters) - Nigerian ironworker Ba Kaka initially felt sympathy for Boko Haram's violent uprising against a State he and many others saw as corrupt, un-Islamic and kowtowing to Western ideology. But as deaths mounted in the Islamist sect's bloody campaign against state institutions, security services, Christians and even school children in northeast Nigeria, he began to see them as a threat to his life and livelihood. "We thought they were doing God's work at the beginning, but over time, we realised they were just a cult," said Kaka, who was forced to close his shop in the northeast's main city of Maiduguri after a spate of Boko Haram attacks in his area. Kaka is part of a popular backlash against the Islamists - a member of one of a number of government-approved vigilante groups that have become a weapon in a military offensive that has dismantled Boko Haram networks and squeezed its fighters into a mountainous area by the Cameroon border. Though the sect remains the gravest threat to Africa's most populous country and top oil producer, it is weaker than it has been for years. Yet the decision to give these gangs of largely unemployed youths the go ahead to hunt down militants risks dragging civilians further into the north's conflict. Reprisals are already a problem, and security troubles could emerge further down the line, as has happened in the past with youth gangs. Though the state is not giving them guns, a few have acquired them anyway. Kaka himself uses his iron-working skills to fashion bladed weapons like machetes for the militias. "With all the death around us, we have gone beyond being afraid of them," he said, gesturing to a dusty street in his area where a local politician was gunned down by the militants. Since an uprising by Boko Haram was put down by the security forces in a 2009 offensive that killed 800 people, the group has enjoyed mixed support from a population caught between it and a military and police often accused of using indiscriminate force. That support - or acquiescence - appears to be waning. "Unprecedented mass popular action against the group is the most serious setback to its armed campaign against the Nigerian state ... since the military crackdown in July 2009," said Adam Higazi, an Oxford Analytica researched based in north Nigeria. Boko Haram, who seek an Islamic state in religiously-mixed Nigeria and who rarely contact the media beyond Internet videos uploaded by leader Abubakar Shekau, could not be reached for comment. In Maiduguri, a city of tall trees and mosques ringed by tin-roofed slums at the edge of a semi-desert, youths armed with sticks man checkpoints. One group examines car boots and bags for bombs. The military has arrested hundreds of Boko Haram suspects since President Goodluck Jonathan declared a state of emergency in three states in northeast Nigeria in May, and it has praised local vigilante groups for helping identify and denounce them. "If people had given us this type of cooperation earlier, we could have done better in tackling the insurgency," northeast military spokesman Lieutenent-Colonel Sagir Musa says. A number of vigilantes interviewed by Reuters said they were fed up with being caught between the two sides. "Unless something was done all of us would be killed sooner or later by either the Boko Haram or the security operatives who were suspicious of every youth," said Ba-Lawan, 25, founder of a vigilante group in Maiduguri. "It was to save ourselves." Mohammed Kawa, 28, said he feared Boko Haram would "turn all of us into their slaves" if nothing was done to stop them. Before May, Boko Haram had seemed close to setting up a de facto Islamic state in the lawless border areas around Lake Chad, where Nigeria meets Chad, Cameroon and Niger. Local council officials had fled and police stations were empty, especially in Borno state, relic of an old Islamic caliphate. The military crackdown has re-established sovereignty over these areas. Military officials say senior Boko Haram commanders have also been killed or arrested - though they decline to name names - which could mean a secession crisis if Shekau is caught. At a desk in the capital Abuja, surrounded by folders marked "confidential", a top Nigerian security official, who declined to be named, watches recently-seized Boko Haram recruitment videos and scans satellite images of the Gwoza hills, next to Cameroon, where he says Shekau is suspected to be hiding. Alongside videos of Boko Haram members demonstrating how to stitch a suicide vest - "here's one I made earlier," says one in the northern Hausa language, as if baking a cake for daytime TV - there is also one of "traitors" being executed. Two suspected state informants are beheaded in a field by masked men wielding Ak-47s to creepy music praising jihad. Since the vigilantes rose up, Boko Haram, whose name roughly translates to "Western education is forbidden", has turned on civilians. Fighters killed dozens of people in assaults on Western-style schools, which Islamists suspect harbour youths who are informants. "Boko Haram can intimidate the (vigilantes) by targeting their family members and villages where they are strong," said Jacob Zenn of the Washington-based Jamestown Foundation. This will in turn lead to paranoia and over-reaction by the vigilantes when they hunt homes for militants, he said. Shehu Sani, president of Nigeria's Civil Rights Congress, says there have been cases of summary executions and burning down the houses of suspects by the vigilantes - the sort of abuses Nigeria's military had been accused of in the past. "The army is starting to use them to perpetrate things they don't want to be seen to be doing themselves," he said. Nigeria's history is riddled with examples of angry, destitute youths who formed groups backed by politicians for a particular purpose, which then grew out of control. Indeed, many describe Boko Haram itself as one such group - author Wole Soyinka last year said some northern politicians had "conjured up a Frankenstein" with their initial backing for it. Militants who besieged the oil industry in the southern Niger Delta last decade were politically sponsored at first. And the underlying drivers of violence and instability in Nigeria - corruption, extremes of wealth and poverty, lack of economic opportunities for the young - remain in place. Underscoring the risks, rival vigilante groups have clashed in recent days over control of the town of Biu in Borno. Five people died in clashes on Sunday. That presents the military with a dilemma: back off from supporting the vigilantes and leave them to be killed by Boko Haram, or sustain a movement that could later turn against the State.